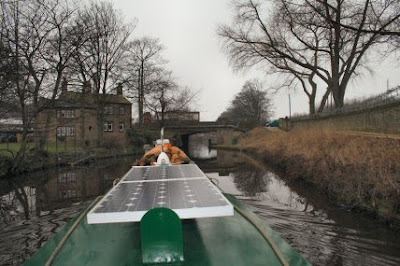 nb Success had finished its visit to Huddersfield and went past on their return to Stanley Bridge. That was the only other boat moving today that we saw. 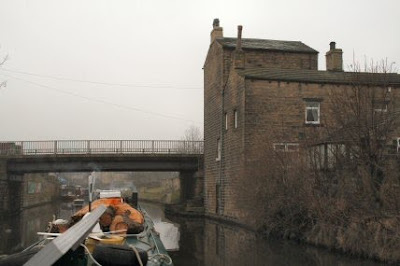 As we left the moorings at Mirfield I noticed the house that stood next to the bridge. There it was. 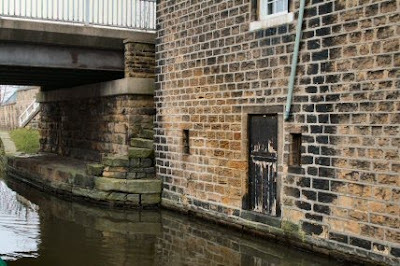 A door that lead straight out onto the canal. I wonder what that was used for in the past. Handy if you have your own boat. Up at the flood lock the indicator still said green so opened up and moved out onto the river again. All day we have hopped from river to canal and back again. High banks and lots of trees. Periodical one comes across some of the old parts of the canal industry and in the main they have been cleaned and look in good nick. Whereever we are it is only a few minutes from the middle of Huddersfield and it feels like the middle of nowhere and in the countryside. 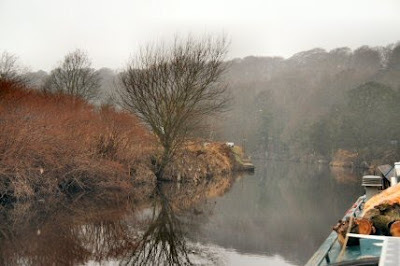 It has been misty all day and the difficult lock of the day is at Kirklees. Two 57.5 foot boats won't fit in here but if you're not in a hurry its no problem really. It just takes twice as long to get through. The handspike is getting used a bit more often now with sluices needing it at every lock. 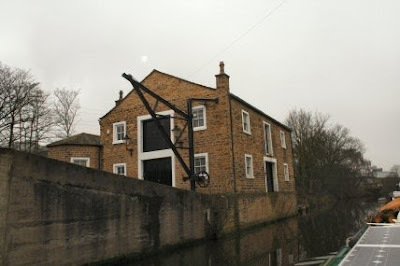 Eventually we reach Bridhouse locks. Through the first lock - where we can both get in - and into the basin. A couple of BW workboats are moored here. 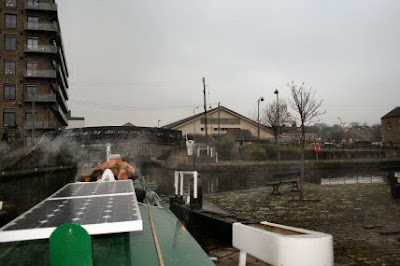 The Brighouse and the Dewsbury were moored opposite the second lock. 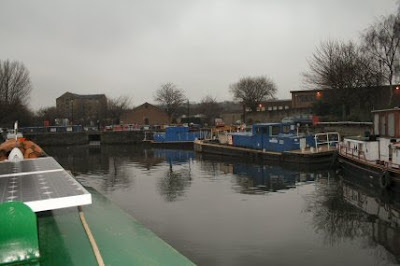 Tonight the mooring is right outside Sainsburys which is the light coloured building on the right. In front of it is the facility block. I will have to reverse there tomorrow and pick up water. If its a quiet mooring it is likely that we will stay here tomorrow and go for a wander.